I was in O’Hare airport in Chicago, Illinois today and saw something fun: a parade. 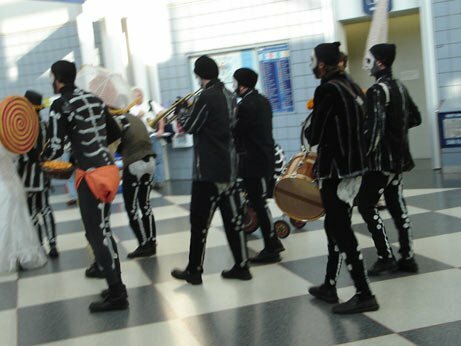 A bunch of halloween skeletons, dressed, dancing, smiling, and generally creating a bit of performance art in Illinois. But what made me smile most of all was the reaction of most of the folks they encountered. I think they liked it, but you wouldn’t know by watching them. They often looked away, pretending there were NOT a bunch of skeletons laughing in the airport. And even when they offered some Tootsie Rolls, most declined. Cool for me though: when I said I love Tootsie Rolls they gave me a handful! How Cool is That! ?